If you are a 12-year-old boy who struggles with your weight, you're not alone. The amount of obese adolescents from 12 to 19 years old more than tripled since the early 1980s, according to the Centers for Disease Control and Prevention. Kids start having trouble staying at a healthy weight when they eat too much without getting enough exercise. Get started on your road to a healthier body by making simple changes thatyou can keep up all the time. Because kids and teens grow at different speeds and begin growing at different times, you may not be able to tell on your own whether you are actually overweight. Ask your parents to set up an appointment with your pediatrician and talk to your pediatrician about your concerns. She can use a chart to compare your current weight with weights of other 12-year-old boys at your height and help you determine whether your weight is in a healthy range. If you weigh more than about 84 percent of all boys of the same height, your pediatrician may recommend some healthy changes that will help you gradually lose the excess weight. Many 12-year-old boys are into indoor activities such as playing video and computer games and watching television with friends. If you tend to spend most of your time on the couch, you're probably not getting enough exercise. 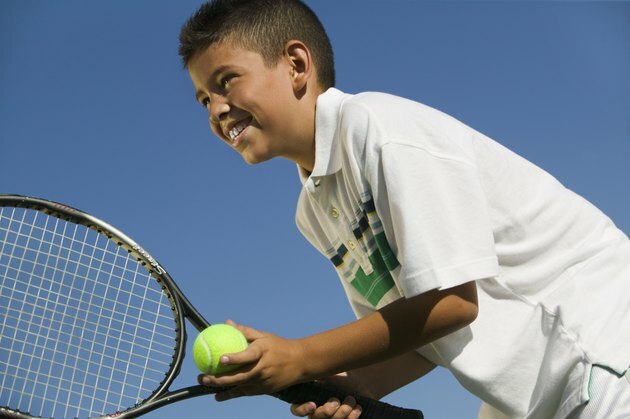 Most kids and teens need about 60 minutes of exercise every day, all at once or broken up into smaller sessions. Physical activity helps you build strong bones and muscles, gives you energy to play sports and get through the school day, and helps you burn calories to stay at a healthy weight. If you're not into sports, don't feel forced to try out for school teams. You have many other fun options that don't ever have to feel like exercise. For example, ride your bike or skateboard to school with your friends, pick up rock climbing as a hobby and ask your parents to get you a motion or dance video game for your birthday. Every little bit of activity counts toward those 60 minutes. Junk foods and sugary drinks such as soda and juice tend to carry lots of calories, which contribute to weight gain. However, just because you're trying to eat healthier foods doesn't mean you need to eat salads when your friends are eating french fries. Small changes in your diet will add up. For example, replacing just one can of regular soda with a glass of water each day could save you over 1,000 calories per week, according to KidsHealth, a part of the Nemours Foundation. Other ways to eat healthier without feeling hungry: drink low-fat milk rather than whole fat milk, fill up on at least one fruit and vegetable each meal, eat nutritious snacks such as whole grain pretzels and frozen grapes at snack break, and take a smaller slice of cake or handful of chips at birthday parties. Kids and teens who get support from their families are more likely to succeed at losing weight than those who don't, according to KidsHealth. Your parents can help you by choosing healthier snacks for the pantry, cooking more meals at home rather than buying fast food, and encouraging active family hobbies such as hiking and biking. Health Services at Columbia University: Weight Loss Tricks for Big and Chunky Teens?